This compact 1-watt LED flashlight from Bushnell provides a piercing beam thanks to its ultra-bright Luxeon diodes that are up to 20 times brighter than standard LED bulbs. They also have a lifetime of 100,000 hours for long-term use. Its rotating head selects between continuous beam, SOS and safety strobe modes for versatility, and the secure mode prevents accidental activation or deactivation. The battery life indicator glows at all times, making it easy to find in the dark. 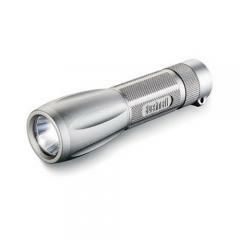 The flashlight is made from aircraft grade aluminum and features a hard anodized coating that prevents scratches. Textured panels provide a secure and comfortable grip.